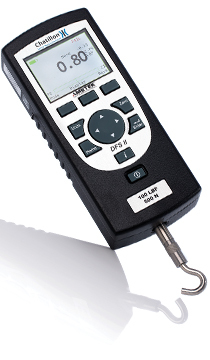 The DFS II Series offers the best price performance of any digital force gauge available today. This easy-to-use digital force gauge is designed for basic and complex applications, and is ideal for handheld or test stand applications. This digital force gauge is often used to collect tear strength test data on new materials, while it allows you to perform statistic analysis on the data directly on the screen. By mounting the DFS II to a Chatillon LTCM test stand you can perform testing at the end of a production line and transfer the results to a PC for analysis. Find out which adapter you need for your DFS II digital force gauge in this Connection Diagram. Find the Declaration of Conformity for the DFS II Series force gauge here.